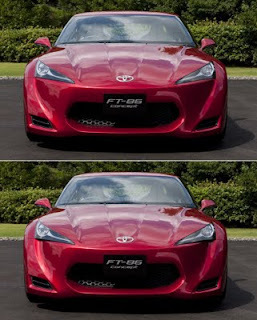 Toyota announced the possible production of a revisioned AE86 concept dubbed the FT-86. It is a rwd light sports car powered by a Subaru engine. This was a joint project of Toyota and Subaru after Toyota acquired Fuji Heavy industries. I think the profile and rear looks decent, but I am not keen on the front bumper at all. 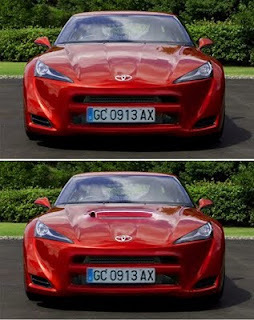 The profile seems to barrow from the Nissan 370Z and GTR but does seem to hint towards the 2000GT. I did a quick photoshop of the Front to get maybe make it more palatable. I removed the headlight vents. I think this greatly improves the front. You can see after and before. I then took the grill from the Gtfour RC bumper and fitted it to the center along with an intercooler for the future FI of the STi engine. ;) The last picture has the RC hood vent, but I am not as keen on it. I think the car can have some potentionly good looks with a new front bumper fitted.